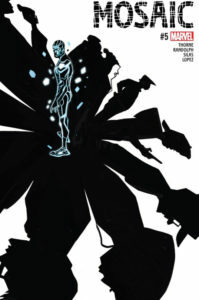 The first chapter of Mosaic’s origin tale comes to something of a close in this terrifically written, beautifully illustrated, emotional gut-punch of an issue; from the creative team of Geoffrey Thorne, Khary Randolph, Thony Silas, Andres Mossa and Emilio Lopez. Former National Basketball Association superstar turned Inhuman, Morris Sackett has seen the entirety of his old life come crashing down as a result of his transformation. Terrigenesis has endowed Morris with the ability transfer his consciousness onto the neurological plain of anyone he touches, allowing him to essential possess that person and gain access to much of the their memories, skills and attributes. Through his journey to try to understand what has happened to him and how his powers work, Morris has learned that his father, ‘Pops,’ has not been the guiding and loving parent he had initially appeared. Rather, Pops has proven a cold and calculating opportunist who has used and manipulated his son to make himself rich. 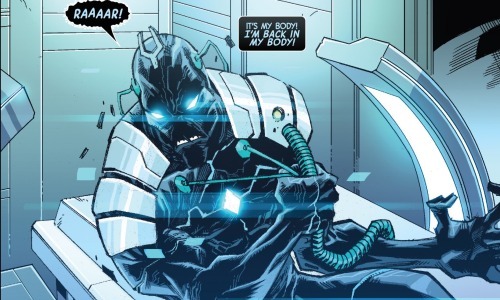 In the previous issue, Morris had occupied the body of The Amazing Spider-Man. 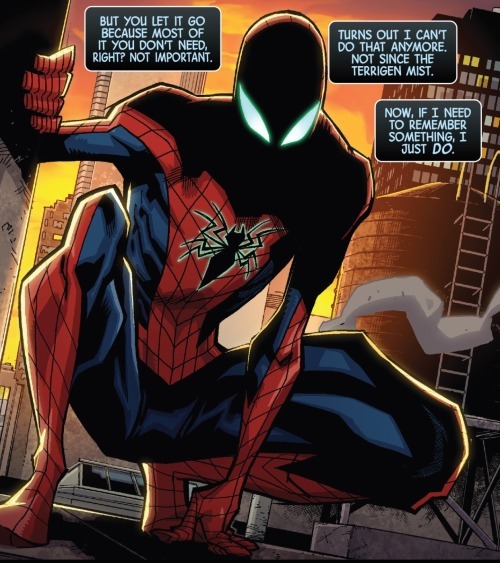 Borrowing Spidey’s impressive intellect, Morris was able to ascertain that he is indeed an Inhuman, that his powers and transformation has been the product of the mutagenic properties of the Terrigen Cloud awakening his latent Inhuman genes. Morris explores his powers further. What he can do is not necessarily a psychic or telepathic possession, but rather the ability to invade consciousness on a neurological level. And doing so has afforded Morris the ability to have greater control of his own neurological functioning… especially in terms of memory. Memories are never forgotten, they do not fade or corrode, rather they are only obscured by the creation of new memories. Morris is able to use his new powers to navigate through the interfering obstacles of recent memories and recall with crystal clarity memories of his youth. And in so doing he is able to recall an event from his early adolescence where he overheard his father having a discussion with another man. Morris had always assumed that this man was a talent scout for a high school or university who might want to recruit Morris for their school’s basketball team. Overhearing their discussion more clearly, however, it is revealed that his father had something far more lucrative and nefarious in mind. Tests had been run on young Morris and the special abnormalities of his genome had been identified. 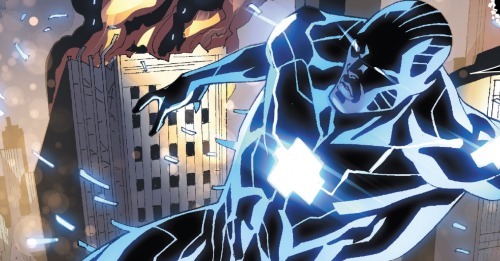 He did not possess the X-gene, but rather something else, something that could possibly be utilized in the development of weapons and/or medical advancements. It’s horrifying. Pops was not trying to advance Morris’ career as an athlete… he was trying to sell his son off as a lab-rat! 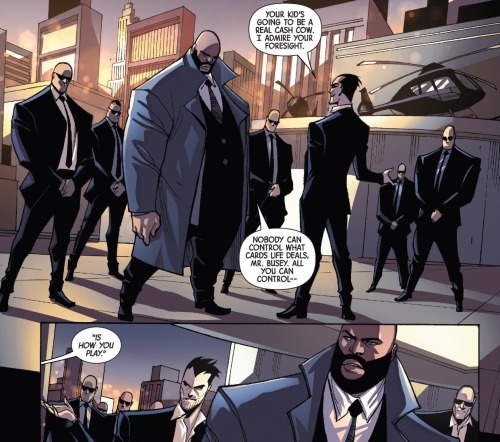 Morris takes this terrible realization in stride, pushing down his sorrow and letting it become anger and determination as he utilizes Spider-Man’s body to break into the Brand Corperation’s headquarters in midtown Manhattan. There he finds several of the individuals he had previously possessed, the young man, Fife, his girlfriend’s assistant, Cece, even the paramedic, Kevin. It seems that The Brand Corp. is keeping these people imprisoned all as part of an efforts to better understand Morris’ new powers. Before Morris can free these prisoners, his body is assailed by a terrible sense of being electrocuted. What is actually happening is that Mr. Busy is using a high-level defibrillator to try to bring back to life Moirris’ seemingly dead original body. All these time, Morris has been a disembodied presence, a kind of invisible wraith who is only tangible when he possesses the body of another. He had not given much through to his original body, possibly assuming that he no longer had such a body. 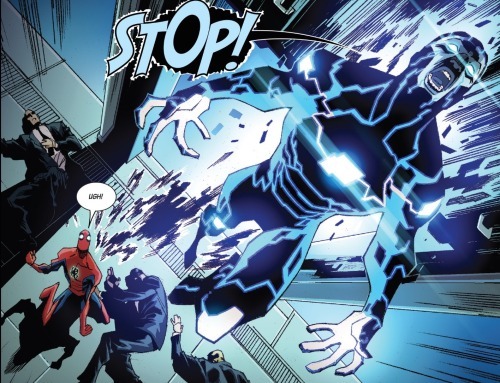 The electrical charges pull Morris’ consciousness out of Spidey and back into his original form, a monstrous being with a rather distinctive-looking tuning-fork-like glyph protruding from his forehead. Back in his original body, Morris tries to fight off the Brand’s agents. Yet he is weakened and clumsy in his true body and the Brand agents are able to use taser batons to subdue him (electricity, it would seem, may be one of Morris’ more pronounced weaknesses). Seemingly defeated, Morris’ body is loaded into a status chamber and prepped for relocation to one of The Brand Corp.’s research and development facilities elsewhere. As they get ready for departure, Pops show up to collect his fee. Morris will be dissected and studied, but Pops doesn’t seem to care as long as the check clears. His own son… it’s deplorable and heart-breaking. Fortunately, Mousers hasn’t actually been incapacitated. At the last moment he had leaped from his original body and possessed the body of one of the technicians. In this body, Morris confronts his father. Pops attempts to explain himself. Life is all about the hustle and the grind, Pops essentially says. You make money where you can and you look out for number one. Sure Pops has betrayed his son, but he’s remained true to the basic lessons that he has always tried to impart on him… one gets ahead in this world by taking advantage of every sucker you can… even if it’s your own child. It’s terrible, but Morris is taken aback by the awful truth that all this is very much in-tune with how he had lived his own life up to now. He never cared about his teammates or coaches, the various hangers-on in his entourage, his girlfriends and lovers. He has been just as bad as his Pops… can he really blame his father for being true to his own philosophy. Mr. Busy, The Brand Corp.’s primary agent in this whole affair, takes advantage of Morris being so taken aback and strikes him with a stun-baton. Another fight breaks out, but the Brand agents are no match for Morris and his body-switching powers. He triggers a grenade to go off, engulfing the rooftop helicopter pad in a tremendous explosion. Pops survives the explosion, but is left on the rooftop, circled by flames with no means of escape. Possessing Busy’s body, Morris speaks his final words to his father. He tells him to no longer call him ‘Morris.’ There is no more Morris, there never really was… only the shadow of a man that Pops had crafted him to be. He’s done with his old name, done with his old life. He is something new now, something different and, above all else, no longer his father’s son. Really intense stuff. It had been rather clear in the earlier issues that Pops was a tough and overbearing parent, but I had not expecting him to turn out as such a reprehensible villain. It’s both saddening and kind of rage-inducing at the same time. Who is to say if this is the author’s intentions, but the whole matter made me think of the human-trafficking crisis occurring all over the world. I’ve read these terrible stories of fathers or boyfriends essentially selling young girls into prostitution rings. A modernized equivalency of the slave trade. It all undermines one’s faith in mankind. At the heart of such atrocities is cognitive ability to look at a fellow human being as an object. To suppress the knowledge that a person has thoughts and feelings and just see them as a commodity. This is what pops does with his son. He doesn’t view Morris as an actual child but rather an investment that he developed in order to sell off for a payday. It’s an evil beyond words. Pops’ whole rationale behind doing such a thing is this weird, street-level version of the survival of the fittest. Whomever puts in the most work, the most grind, the most hustle deserves to be on top; and whomever gets used or hurt also deserves it because they were not smart enough, savvy enough to know that it’s every man for himself. Pops is pretty much a psychopath. The primary feature of psychopathy is the inability to feel empathy; some cognitive impairment that disables the person from sympathize and commiserate with he feelings of other people. It makes for an interesting contrast to Morris, who by way of his new powers is something of a ultra-empath. He can actually enter the minds of others, experience what they experience, know what they know, and feel what they feel. Morris can never be like his father because he has quite-literally walked in other peoples’ shoes. Who knows how the original Morris would have reacted to his father’s betrayal. That original Morris no longer exists. He is now a conglomerate of different thoughts and feelings intermixed with his own. He is no longer who he was and has left behind his life, his body, and his name. Not for the feint of heart, but nonetheless highly recommended. Five out of five Lockjaws.